The 27.22 metre expedition motor yacht Belle Isle has changed central agencies and is now listed for sale by Adam Essex at Camper & Nicholsons International. Belle Isle was built to Lloyd's class and launched at China’s Kingship yard in 2010 as a steel and aluminium semi-displacement yacht designed by Vripack. An interior by Addison Nelson Design has wood in natural coloured oak throughout, giving her a clean and spacious feel while the saloon is divided from the dining area by a small cabinet with a retractable television screen so as not to interfere with sight lines. 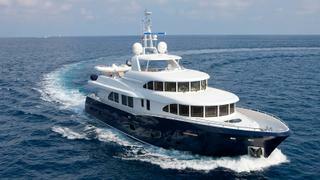 MCA compliant, this yacht for sale boasts accommodation for eight guests in four cabins. The master suite has all around windows with excellent views and features a spa bathroom. The VIP cabin is full beam and has his and hers bathrooms while two twin cabins have en suite facilities finished in Chinese marble. Her flybridge boasts a Jacuzzi spa tub and there is plenty of space to socialise and enjoy the sun. Freestanding sun loungers are currently used to allow flexibility of seat positioning and the tender is also stowed on the aft end of this deck. A true oceangoing yacht, Belle Isle has twin 479hp Caterpillar engines allowing a maximum speed of 12 knots and a range of 4,000 nautical miles at nine knots. For added safety and comfort at sea and in port, she is fitted with Quantum zero speed stabilisers. Belle Isle is asking €3,900,000.